Jack introduced me to the ladies and my date, Rosemary. She was surely pretty. She touched my hand and asked, “Do you like to dance?” I replied, “I love dancing. I’m a graduate of Tune Town (teenagers only and soft drinks—on Olive east of Grand)” Jack was a buddy of our waiter and talked him into bringing over a champagne bucket and towel and putting in it our ginger ale bottles to cool. First dance, Rosemary, only four feet nine, took my hand and whispered “fox trot” in my ear. After our second dance, we went back to our table and ordered dinner. We six teenagers were the only young folks in the room. To old married folks, all had a chuckle ove3r our “champagne bucket” of chilling ginger ale. We moved out on the dance floor and tried the jitterbug numbers so the folks wouldn’t think we were square. We sat with our friends awhile and the orchestra started “Star Dust”. Rosemary took my hand and we danced cheek to cheek forever. I whispered to her, “Can we do this for the rest of our lives?” We stopped in the middle of the dance floor and she kissed me on the lips. The folks around us applauded. We went back to our table and Mickie said, “First date—what’s going on?” Rosemary smiled and said, “I think we are two 16-year-olds who just got engaged.” Everyone said, “What about your folks?” I said, “They are already married to one another. We may not tell them for a few weeks.” Jack went over to the cigarette counter and came back with a little gold Cuban cigar ring. Jack said, “Do it right now—on bended knee.” I did so and Rosemary pulled me over and kissed my eyes. The room applauded and laughed. Our orchestra played Star Dust and we all danced our way to the car. That’s 14 posts! 15 counting this one. Did I forget anything, Bill? Maybe I should have entitled this one, “The Complete Bill Jones Reader”? Happy 92nd, Bill. We wish you many, many more. 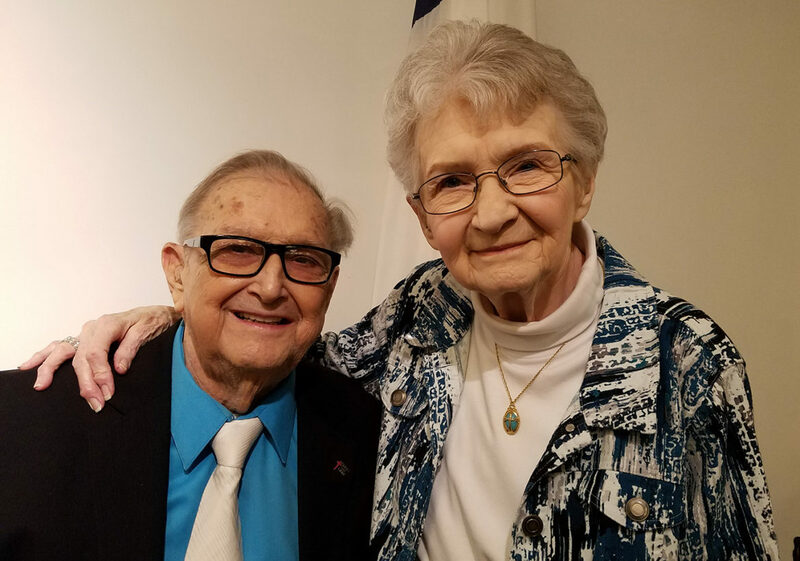 Bill and Barb Jones at Bill’s 92nd birthday party at the Maplewood Baptist Church on Saturday the 2nd. With five generations represented, I left before things got wild. Thanks to Sister Sheila and Sister Denis of R-K years past, I can spot a typo from 9 yards! I’m also a firm believer in the Oxford comma – for clarity. What happened to Rosemary? I met my Rosemary in Maplewood. We went steady for five years and then got married, almost 57 years ago. Still my little sweetheart. Well I can’t answer that one, Don. It sounds as though you and your Rosemary are truly a couple of lucky folks. Thanks for weighing in.